1. How is it that Goldman Sachs convinced the Justice Department that it was feasible to combine thousands of sub prime mortgage loans that were poorly underwritten into an investment grade quality investment? 2. 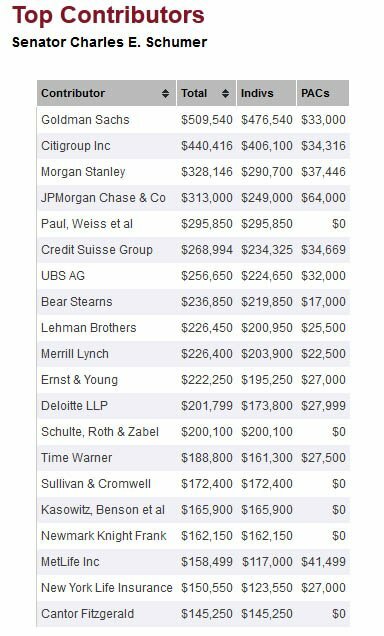 How is it that Goldman Sachs convinced credit rating agencies, that received fees from Goldman, to give an investment grade rating on securities that were backed by a pool of poorly written loans? Was the convincing done by logic or by contributions and huge fees? Below might provide a clue. 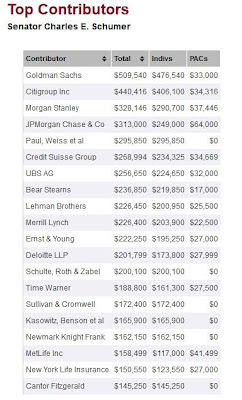 The chart was taken from Opensecrets.org and represents what the top contributors paid Sen.Charles E. Schumer since 1989.